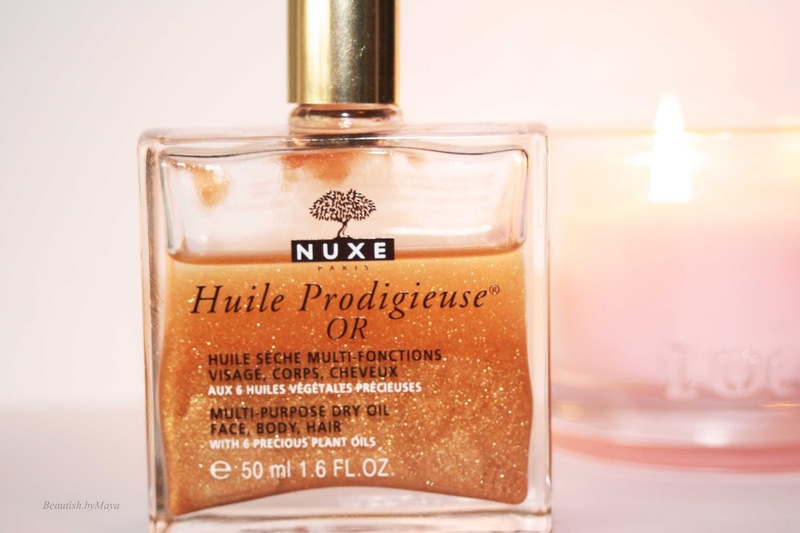 The NUXE Huile Prodigieuse just screams summer, healthy glow, buy me..! The product has real cult status in France and abroad, everybody has heard of it at some point. So far, it has been my favorite summer oil, always with me when on the go. 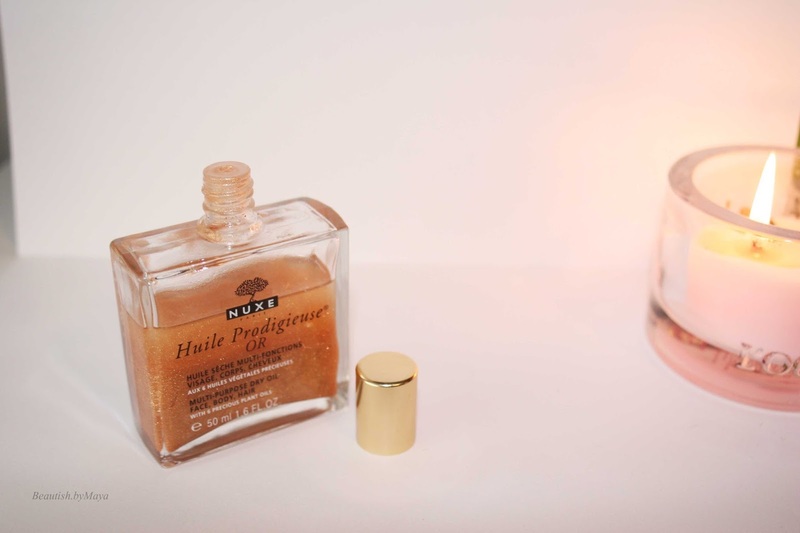 The oil comes actually in two versions: a regular version without the shimmer, and the here reviewed "D'Or" version containing gold shimmer flecks. 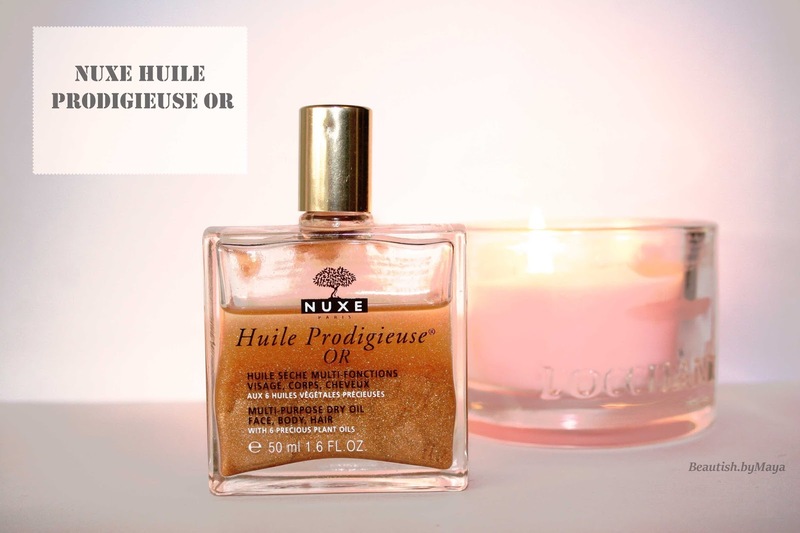 The NUXE Huile Prodigieuse OR is a multi purpose dry oil that can be used on hair and body. The product was first released in France in 1991, becoming the bestselling product of the brand with its scent being recognizable as Nuxe. The oil formula is of natural origin, free of silicons and mineral oil. The star ingredients are 6 dry plant oils: Macadamia, Hazelnut, Borage, sweet Almond, Camellia, and St. Johns Wart. 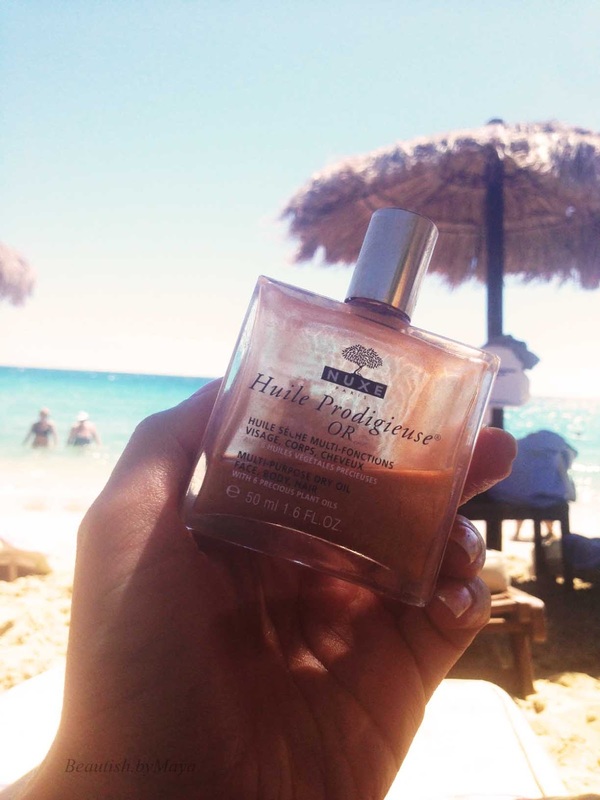 Huile Prodigieuse OR is a dry oil with a unique super-activated formula combining 30% Precious Plant Oils and Vitamin E to nourish, repair and soften face, body and hair in a single gesture. Face and body are soft and velvety. Hair is supple, glossy and full of volume. Thanks to its small golden particles, your skin glitters and reveals its beauty whenever you move. Isn't the packaging pretty..? The product comes in a transparent glass bottle that feels quit luxurious in the hand, the tiny gold flakes make it even more so. The brand releases regularly limited edition bottles in different sizes, I have the regular version. Application is easy, thought the small opening you can control the desired amount. The smell is pleasant, floral, difficult to describe but if you own Nuxe products then you know it. 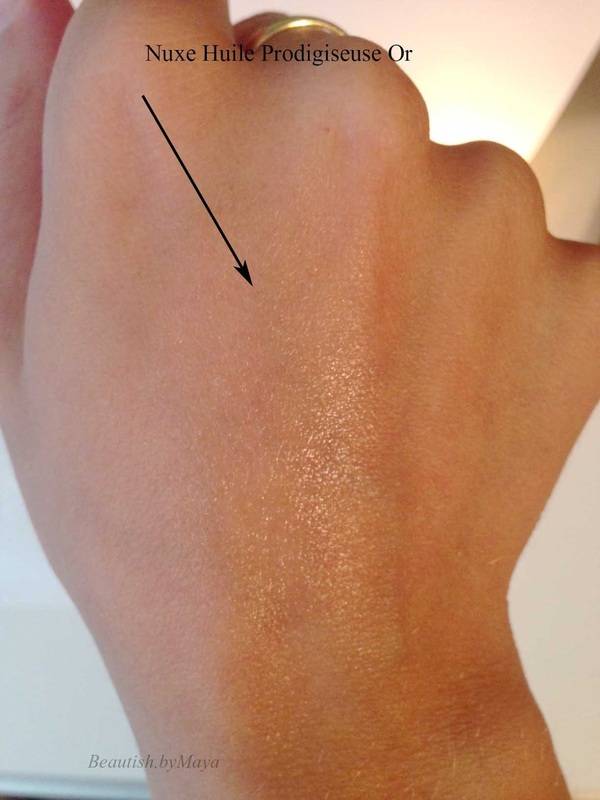 The gold flakes add a beautiful sparkle to the skin, the effect is neither to strong nor subtle, just a I like it. The shimmer finish is not obvious, in the sun it creates an effect of summer kissed skin, a nice glow but not to glittery. My favorite body part to use it on are my legs and chest, depends on if I'm on the beach (then I use it everywhere :)) or just in the city (more subtle approach, just the legs). You can use it also on your hair and face if you want to, but my skin is to sensitive for that. When used on hair It doesn't make my hair grease but you have to be careful and add just a little bit. What I love about this oil is the moisturizing effect, it leaves my skin soft despite the harsh summer weather. Still, if your skin is dry in the summer I would advise to use a body cream first. Additionally, probably the most awesome part is how the golden flacks stick to skin throughout the day. Even after taking a swim in the sea the skin will the retain golden glitter's. Overall, its my favorite dry oil especially for the summer, I'm repurchasing it every year. The price in France depends on where you buy it, but on average you will find a bottle of 30 ml for 20 euro. As expected with Nuxe, outside France (Europe) its slightly more expensive, you can find it here on amazon for 39$, or the bigger bottle (100 ml) for 54$ which is more value for your money. Thanks for sharing! May give it a try, it looks promising!